Where I live in Toronto, Canada, we have had an incredibly cold winter. Like minus 30, freeze your toes, can't feel your face cold. And these cold temperatures have got me craving everything spring! But until then, it's cozy scarves, fur blankets, and doing everything I can to stay cozy at home. So in the spirit of staying cozy at home, I am excited to be partnering with Dimplex, the leader in electric heating, and creator of some incredibly beautiful electric fireplace units. Now, I know what you might be thinking- an electric fireplace? Can you really use the word electric fireplace, and beautiful, in the same sentence? In a recent project I have affectionately been calling A Tale of Two Houses, I designed two homes, for two neighbours, with totally different styles. The houses are mirror images of each other, and their styles are totally different (one more modern, and one more traditional). So when it came time to design the bedrooms, I knew I wanted a fireplace in each of them. Fireplaces in the bedroom, regardless of what climate you live in, are so essential to me- so I want to walk you through why I think every bedroom needs a fireplace. 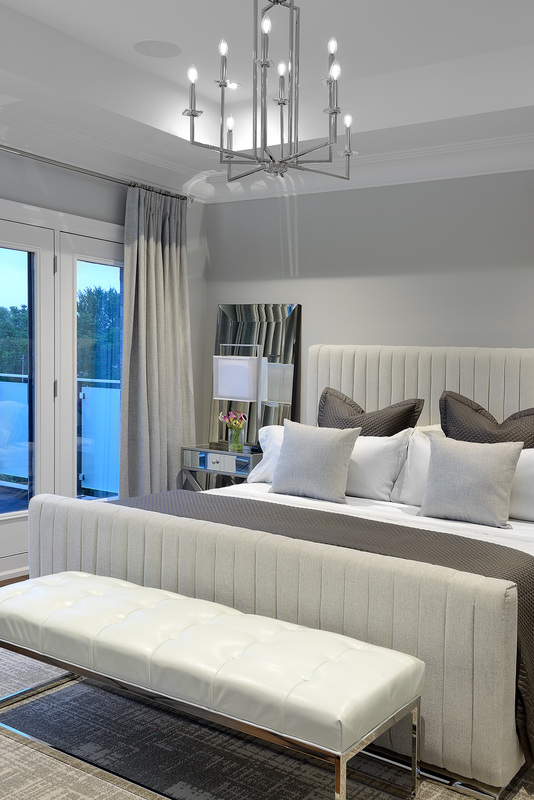 A fireplace provides an ambient glow that is just so cozy, and inviting, in a bedroom. I love making a bedroom feel like an escape, and a sanctuary. And an ambient glow does just that for me! In this bedroom, we used some pretty amazing technology by Dimplex called Opti-myst. Opti-myst is revolutionary ultrasonic technology that creates a lifelike flame and smoke look using water. Check out how the "flame" dances in my YouTube video here. The technology allows for some pretty cool installation opportunities, including 360 degree, free standing units, with no glass enclosure! In this bedroom I designed, the "flame" dances around in the open space in a truly magical way- and is a great option where little fingers that may get burned are a concern. While I definitely use gas fireplaces in my projects, one downside of gas is that it gets incredibly hot, incredibly quick. And in a small space, it can be overwhelming. A benefit of electric in a bedroom, especially those on the smaller size, is that you can control the heat really well. In this bedroom, we used the 34" Prism Series by Dimplex. Simple installation, a beautiful modern aesthetic, and controllable heat make this a winner for me, especially in smaller bedrooms. Don't get me wrong- when I am freezing outside and want to warm up, quick heat is essential. But I also don't want to feel uncomfortably hot- so I love how you can control the heat level with a remote control- even from bed! 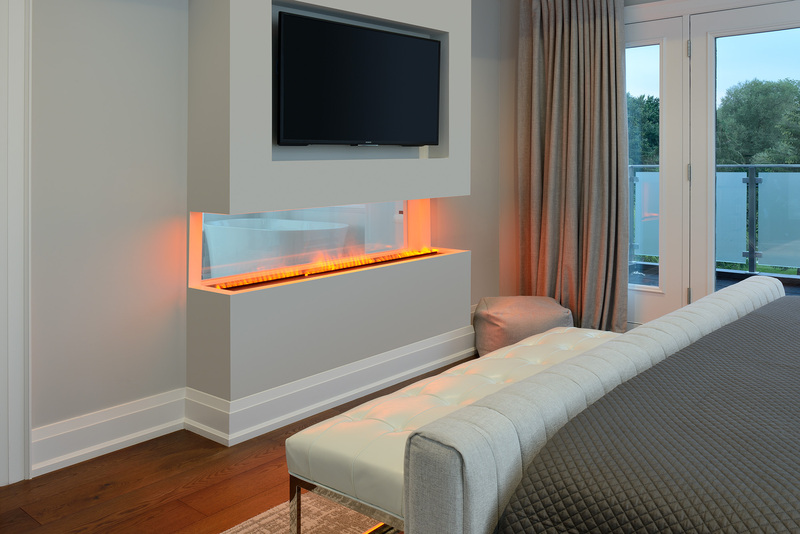 This is the major benefit that an electric fireplace unit has over other options- incredibly simple installation. You can in many cases, in an afternoon, pick up and install your fireplace in your bedroom and have instant warmth in your space (caveat- you will need to make sure you have the correct electrical outlet to handle the amperage of the fireplace- but other than that, install can be very simple!) Warmth and ambiance can be only a few steps away! Special thanks to Dimplex for partnering with me on this blog post. I work very hard to research the brands I work with to provide info that will make your life more beautiful, and more functional.